Last weekend we launched a special mission. 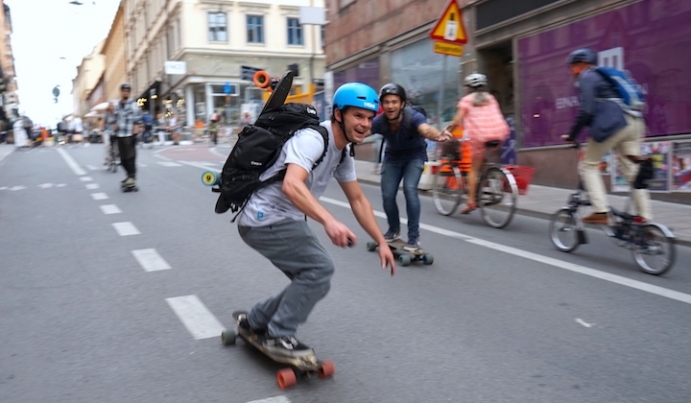 The #HAMMERroadtrip from Hamburg to Munich - almost 800km on a Mellow Electric Skateboard in just 10 days. The young man who has taken on the feat all alone is long-distance longboard aficionado Torben Reimer. He started on the 12th of May and accomplished to reach Munich by the 21st of May. After a bit harsh start in Hamburg Torben unsverwingly continued his mission. Find out about his background and see how his adventure started. Torben's unusual roadtrip wasn't only a personal challenge but is also a statement for sustainable mobility alternatives emitting no or almost no CO2 emissions. Micro mobility has a very low carbon footprint but is still very young so that in most countries it's still not legally accepted. While the route from Hamburg to Munich is usually completed a thousand times a day by plane or car, Torben demonstrated that there are also alternatives. Approximately 164kg of CO2 is caused by a single passenger on a scheduled flight from Hamburg to Munich. With a gasoline-powered medium sized car, it's even 273 kg of CO2 emissions on the approximately 800km journey. Torben showed that there is another way: Equipped with an electrically powered skateboard, backpack with clothes, camera and spare batteries as well as a helmet, he skated around 80km a day across Germany to complete the route as environmentally friendly as possible in only ten days. This way he proved that small electric vehicles are a serious mobility alternative, maybe not for such a long distance at once but certainly for day to day use over a long period of time. Torben's Mellow package consisted of 5 batteries + 2 fast chargers so he could swap in between and charge up in his brakes. He rode half the time in the battery efficient Endless Mode, which is a unique riding mode of the Mellow acting like a cruise control.